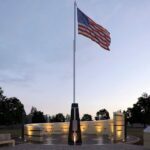 The Fox Valley Patriotic Organization (FVPO) has set out on an impressive plan to create a national monument to celebrate the symbol of our great nation, the United States Flag. The flag tells the story of our nation’s history. It celebrates the arrival of new states, is lowered to honor our nation’s fallen, and marks significant events in time. The design of this monument captures these stories and events in a way that is beautiful and educational. Our goal is to raise approximately $991,500 to construct the monument. 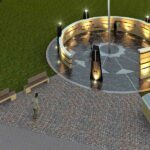 The monument will sit on land donated by the City of Batavia and construction estimates are approximately $840,000. The remaining $100,000 that we plan to raise would be put into an endowment fund with the Community Foundation of the Fox River Valley for any future maintenance of the monument. Our plan is to raise these funds through Foundational support and from the support of patriotic Americans. Fundraising efforts are currently underway and include special events to raise awareness, a brick campaign and grant writing. Our goal is to unveil the finished monument on flag Day, June 14th, 2020.